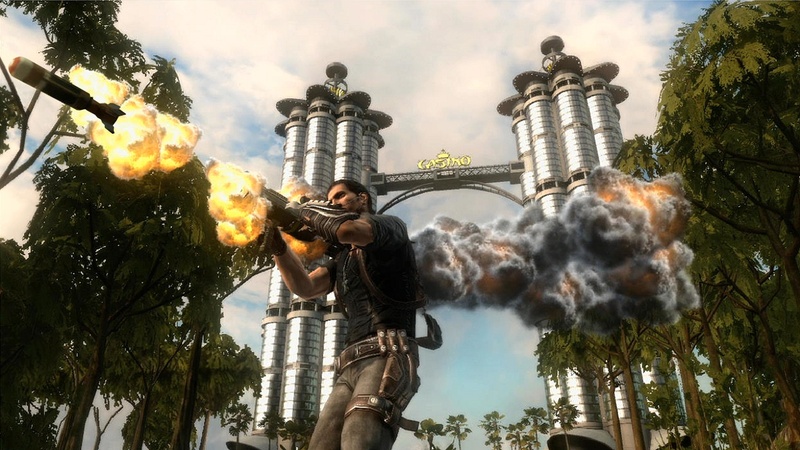 An epic open world adventure set in the diverse tropical playground of Panau in South East Asia , where the aim is to cause chaos and destruction in a way that only Rico knows how!! Your mission is to destabilise the island and free it from the tyranny of the evil dictator Baby Panay . Tackle missions and objectives in any way you want , and explore the 1000 km2 highly detailed and beautiful island by land , sea or air!! Perform an insane range of new daredevil stunts and master the use of the all new grappling hook and , of course , Rico’s trademark parachute . With over 100 vehicles and dozens of upgradeable weapons at your disposal your goal is to manipulate and infiltrate the local factions and create chaos to complete your dangerous mission! Massive selection of vehicles and weapons . Any exciting array of over 100 land , sea and air vehicles with overhauled handling systems . All at your disposal using heavy equipment drops. Different weapon types , single and dual handed weapons , rocket launchers , grenade launchers , explosives , vehicle mounted weapons and dozens more ! All weapons and vehicles can be upgraded on the black-market! Parachute . Use Rico’s trademark parachute to parasail from moving vehicles and to navigate freely around the island and access secure locations. Or even use it to perform crazy base jumps from skyscrapers ! 0 Response to "Just Cause 2 Single Link ISO Full with DLC"